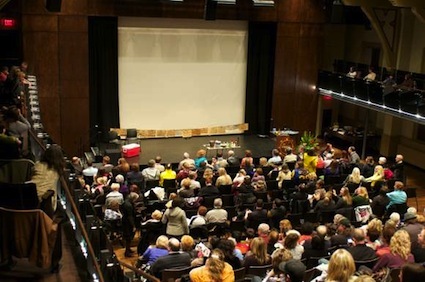 The crowd at Live and Uncorked This Thursday (April 14th), from 4 to 6 p.m., Market Hall Performing Arts Centre is opening its doors to the public for a tour of the new theatre, including guided backstage access. This represents the first opportunity for the general public to experience all of the upgrades and renovations the new Hall has to offer, including all new acoustical engineering, retractable stage, sprung dance floor in the main hall and lobby, new seating and balconies, and $9 million dollars in improvements. "It is this community that has made the wonderful changes to Market Hall possible," says Karen August, Market Hall General Manager. "And we want the community to see what they have helped bring about." PtboCanada live blogged the "Live and Uncorked" event there recently and got a chance to see inside this world-class facility. Check it out for yourself this Thursday.